Americas Best Value Inn Carrollton offers the most value for your money when staying for business- pleasure- or just passing through. We offer clean spacious rooms- free coffee in lobby- free continental breakfast- and free Wi-Fi throughout the property. Our guest rooms include microwave-mini-fridge-hairdryer-satellite TV- HBO- desk with lamp-king and queen rooms and table with chairs. Take advantage of our extremely comfortable beds and relax while saving money year-round with our Kids Stay Free Policy -11 and under in parents room. For your convenience our hotel offers non-smoking rooms. Sorry- no pets allowed. We are located on US Highway 65- and are near attractions such as Carroll County Museum-the Village of Arrow Rock-the Amish Community and Home and Swan Lake National Wildlife Refuge. 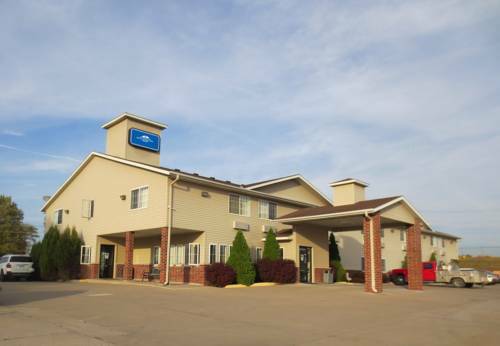 Americas Best Value Inn Carrollton is your best choice within the north central region of Missouri. We offer ideal accommodations and location whether you are in town for business- vacation- sightseeing- or simply passing through on your way to Kansas City or St. Louis. At Americas Best Value Inn Carrollton our goal is to provide our guests with a great experience- not just a place to stay. At Americas Best Value Inn Carrollton- We ve Got You Covered from the time you hit the road until your head hits the pillow. Americas Best Value Inn Carrollton is located on US Highway 65- and is near attractions such as Carroll County Museum and Village of Arrow Rock. Our address is 1408 North US Highway 65- Carrollton- MO 64633.